In this post, we want to talk about Android Bound Service. A bound service is a service that allows other android components (like activity) to bind to it and send and receive data. In the previous post, we talked about local service and we saw how we can create a service, start and stop it. A bound service is a service that can be used not only by components running in the same process as local service, but activities and services, running in different processes, can bind to it and send and receive data. When we implement a bound service we have always to extend Service class but we have to override onBind method too. This method returns an object that implements IBinder, that can be used to interact with the service. In this post we want to analyze how to create a Android service with Messenger. Using this method, we can create a service that can be used by components in different processes. In this case, we use Handler and Message to exchange data between service and other components. A service handler: this component handles incoming requests from clients that interact with the service itself. A Messenger: this class is used to create an object implementing IBinder interface so that a client can interact with the service. So let’s implement the Service. As example we can suppose we want to create a service that receives a string and converts it in upper-case and returns the result to the client. In handleMessage we start handling the incoming requests. The first thing we have to do it “decode” the type of request we are handling. We can use for this purpose the what attribute of Message class. Depending on its value we perform different operations: in our case we just convert in upper case a string. We pass the string value a Bundle attached to the Message, so that at line 12 we get the value. We have to send a response to the client, so we create another Message (line 13) that holds the response and attach a new Bundle holding the converted string (line 14-15). At line 16 we send the message back to the client (we will see it later). At line 3, a new instance of Messenger class is created passing the Handler we discussed before. At line 6 we override the onBind method and return an instance of IBinder interface. Our Service is ready. 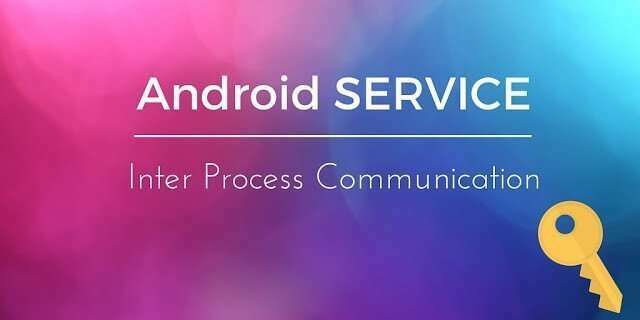 Notice we used android:process so that the Service runs in a different process from the client. This handler behaves like the one in the service implementation, it extracts the response from the Bundle attached to the Message and show the result to the user at line 11. Please notice that at line 9 we set the reply Messenger that will be used the service when it has to send back the response. At the end of this post, you know how to use Android bound service and how to invoke it using a client.